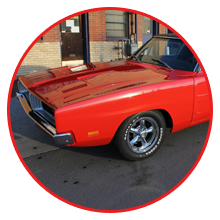 Making the interior and exterior of your vintage vehicle look like it just came from the showroom floor is no easy project, but Jim's Restoration delivers the impressive results you seek. We specialize in restoring all different makes and models of classic foreign and domestic automobiles from the 40s, 50s, 60s, and 70s. Our work speaks for itself, and our earned reputation for bringing cars back to perfect form is as solid as can be. You only need to browse through our extensive portfolio for examples of the high level of detailed craftsmanship you will receive, and that we mean business. This includes matching paint colors exactly. 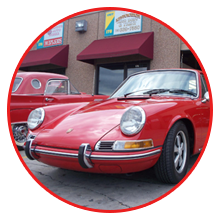 Located in Sheridan, Colorado, Jim's Restoration is a specialty classic car restoration and collision repair shop catering to much older automobiles and antique trucks. Our owner has worked in the automotive repair industry for more than 30 years and restored five cars that were featured in the Denver/Mecum Auto Auction. We love this line of work, and it shows in the finished product. It's what fuels our lives and keeps car enthusiasts and owners returning to Jim's Restoration for various modifications time and time again.